I receive quite a few emails, texts etc. each week asking me…..
You know who I am talking about here, right? The same Paul Finebaum who is on the SEC Network on Saturday mornings…. The same Paul Finebaum who has a FOUR hour on-air radio program on the SEC Network Monday thru Friday and the same person who amazingly shows up on ESPN, CBS Sports etc to offer his “expert” opinion on college sports, more specifically “Southern” sports. I don’t use that term in its modern MTV “that’s cool” connotation…. I use that term as it was intended; someone who “exploits” other human beings for their financial benefit and abuses them in the process. Paul Finebaum’s parents moved to Memphis from New York…. That’s right, New York, which may explain why he doesn’t have a Southern accent….. He couldn’t make it as a legitimate sports journalist so what did he do? 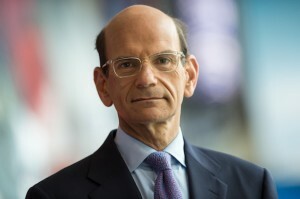 Paul Finebaum created his very own niche in radio…. He promotes and gives the stereotypical ignorant Southerner a platform…. He gives the outrageous and worst among us…. Paul Finebaum’s smug look as callers scream and argue and scream at each other some more is a “look” that most of us that grew up in the South recognize quickly. That we are all just like those callers on his program…. I will tell you, and I believe most “real” Southerners feel this way…. You can call me anything you want, but if you call me “white trash” then you are going to have to wear me for a while and it’s going to be an uncomfortable experience for you. He is enjoying every minute of it in the process. Because he thinks he is better than us….. Living in the South doesn’t make a person a Southerner anymore than being stationed in Iraq makes someone an Iraqi. If you think I am still being too harsh then tell me when was the last time you saw on ESPN’s College Game Day any of the hosts get up from their respective seats and attempt to incite the local crowd and turn them into an angry mob? I don’t (and won’t) listen to Paul Finebaum and will turn the channel when he is on…. He has to have the best agent in the world…. If I would have had his agent in my corner I would already have had five books on the NY Times Best Sellers list.